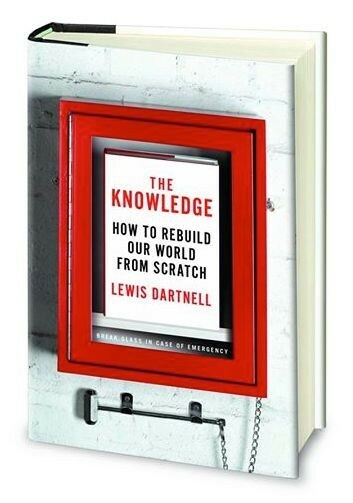 The Knowledge attempts to provide a guide to the fundamental principles and processes that underlie our civilisation, and so how to rebuild from scratch if you ever needed to. But trying to rebuild civilisation and resurrect practical skills purely from the knowledge contained in a guide book would be a huge challenge, no matter how extensive it might be. Tasks are achieved not just by knowing the correct information, but also by possessing the required practical skills. 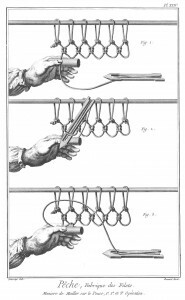 Diderot recognised this short-falling in the mid-1700s and so attempted to preserve not just facts in his encyclopaedia but also the practical or manual skills needed in carpentry, weaving and mining, for example, in detailed engravings. While a picture may well be a worth a thousand words, how can you hope to capture the subtlety of the dextrous motions required for, say, carpentry in just a few images or even a video? Achieving the required ability can take years of apprenticeship, under the tutelage of an already-proficient craftsman. This is the problem of implicit or tacit knowledge; something you may know how to do yourself, but would find extremely challenging, if not impossible, to successfully convey to someone else in just words or pictures. The process of acquiring tacit understanding is not simply memorising information, but is more like learning a new language. And this is not restricted to crafts like weaving or blacksmithing, but the intricacies of procedures used in research too. Scientists are rarely able to achieve learning a new experimental technique themselves solely by reading about the method in published papers but by being taught it by someone already experienced, usually by spending time in the lab in question and learning hands-on. And what if we consider an even more awkward, but not improbable, eventuality. What if reading is itself lost in the aftermath of the apocalypse? Within perhaps just fifty years of the Fall there may be no living survivors of our civilisation, and if there wasn’t the inclination to teach reading and writing to the next generation – perhaps the struggle for survival alone was pressing enough – then any written resource becomes essentially useless. The quick start guide would only be read far, far down the line when civilisation may have already recovered by its own devices and future philologists are trying to decipher and translate our dead language, like we once did with Egyptian hieroglyphics and the Rosetta Stone. The conundrum of how to communicate unambiguously to future generations without the use of writing has been seriously considered by those trying to protect nuclear waste storage sites. Much nuclear waste stored in underground bunkers will remain radioactive, and so highly dangerous, for millennia to come – these poisons could quite easily outlive the civilisation that generated them. The challenge, then, is how you can you post effective warning signs on the site that will still be unambiguously understood 10,000 years in the future? Clearly no language spoken today, or at any time in the past, would still be recognisable after such a stretch of time (Shakespearean English is only four hundred years old and stretches my concentration; the Old English of Beowulf is practically incomprehensible as a foreign language). And any symbol, such as the three-pronged emblem for radioactivity or skull-and-crossbones for poison, is only understood if you’ve already been told what it means; symbolic meaning is culturally imbued. There is nothing universal in the meaning of even a picture of a human skull – they are sometimes considered lucky. So how do you communicate danger, and the form that it takes, without risk of misinterpretation to a future culture that speaks no language you have ever heard, and may not even understand what radioactivity is? (Or perhaps should you dispense with conspicuous notices altogether and just try to conceal the crypt as best you can, hoping it won’t be chanced upon for a hundred centuries? Any attempt at warning may inadvertently have the ‘Wet Paint’ effect and instead prompt an investigative poke of the finger, or even the belief that in fact you’re hiding something really valuable and just trying to ward people away). And by extension, how could you construct a guide for recovering step-by-step towards a technologically-capable civilisation when your unknown recipients can’t even read? 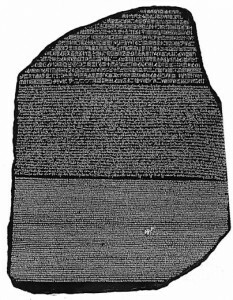 Could you teach a written language by starting from simple symbols and inscriptions alone?